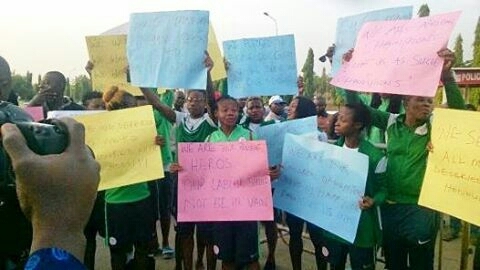 The players of Nigeria’s senior women’s national team, the Super Falcons, were said to be staging a protest at the gates of the National Assembly to press for the payment of their unpaid bonuses and allowances. According to Premiumtimes report, President Buhari is due at the National Assembly today to present the 2017 budget before the legislature, and will address both chambers of the assembly – the Senate and House of Representatives. The female footballers plan to continue their protest till the president arrives. Aside bonuses that accrue from winning the 2016 AWCON, reports says, the players are also owed bonuses and allowances from the qualifiers leading up to the AWCON.